As schedules get more hectic, many people opt for online invitations to parties rather than taking the time to print, write, address, stamp and mail individual invitations. Before simply sending off an email or a virtual card, it is important to know how to construct an "evite" so that it matches the party as well as provides all the critical information. Individual emails: A personalized message is one of the easiest types of electronic invitations, but it can be tedious to type and send notes to large numbers of guests. Mailing lists may be used instead, but it is possible that messages with large numbers of recipients could be misdirected into a spam or solicitation folder and accidentally deleted, particularly if attachments are included. Evites: Rather than using your own email account to send invitations, consider using a free electronic invitation system like evite.com or pingg.com. These services are free and easy to use. They provide a simple mechanism for sending out event updates and tracking RSVPs. Virtual cards: Companies like Blue Mountain offer free online cards that can be used for invitations complete with music, animations and colorful images for bachelor parties, holiday, and other popular themes. It's important to note that it is not usually possible to mail cards to a variety of recipients, and sending each one individually can be time-consuming. Webpages: With minimal knowledge of html or other programming languages, it is possible to create a customized webpage to serve as a party invitation, and a quick email to guests can give them directions for how to access the page. Take care not to put sensitive information on the page (addresses, for example), unless the page will be protected from uninvited visitors. The best invitation is one that can get critical information to guests conveniently. Since many people check their email messages multiple times a day, using an online method to invite guests to a party ensures they have the information as soon as possible without any hassle of lost mail, unpaid postage or mangled envelopes. 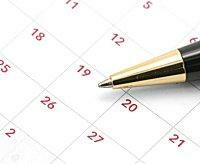 The convenience of planning an online announcement or invitation can also be a problem. It is very easy to forget important information or to overlook other details. Whether the invitation is on paper or sent electronically, careful planning ensures a flawless and organized event. Since online invitations arrive nearly instantaneously, many people send them out later than they would traditional paper invitations. While there is some leeway available for such deadlines, it is important to send invitations so guests receive them with plenty of time to decide whether or not they will be able to attend. Most invitations should be sent one to three weeks ahead of time. Longer lead times are appropriate for formal events, holiday parties when other family commitments may interfere, or if travel will be necessary. Many recipients can easily overlook email messages, or those messages may inadvertently be lost or deleted. Therefore, it is important to send reminders to guests prior to the party. A quick note or phone call three or four days before the event is sufficient to remind guests about the party, as well as to contact anyone who may not have responded. Electronic invitations should always include response and contact information so guests can accept or decline the invitation. While a return email is the most frequent choice, hosts should also provide a phone number and mailing address in case guests have difficulty responding online. 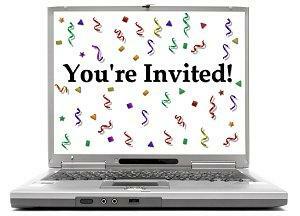 Online invitations are generally casual and are not appropriate for every situation. Extremely formal events such as weddings or any grandiose event (catered luncheons, elaborate anniversary parties, etc.) require traditional invitations, although email RSVPs and reminders can be used. Hosts should also be aware that not every guest may have immediate access to online formats, and traditional invitations are a more sure-fire way of spreading the word about an upcoming event. Are Online Invitations the Right Choice? In this age of electronic convenience, online invitations - emails, e-vites, virtual cards and webpages - are quick and easy ways to let guests know about an upcoming fete. So long as the invitations are carefully planned and offer guests the same information as a traditional paper format, they can be useful for most events, letting hosts and guests connect quickly without the hassle conventional invitations might present.